Departures, in its Arts Issue, lists Zoe Buckman as one of the faces of art activism today. The article explores the work and inspiration of twelve artists making an impact. 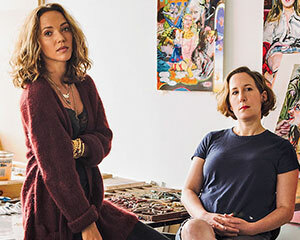 Zoe Buckman (left) and Natalie Frank had hoped their work would be largely irrelevant by now. In pieces like Let Her Rave (Buckman’s bouquets of boxing gloves bound in wedding-dress fabric) and “The Brothers Grimm” (Frank’s series of drawings reimagining fairy tales as centers of female power), the two friends marry the fiercely feminist and the stereotypically feminine to explode gender norms. “I thought having to explain the visibility of gender codes would be mostly behind us by now,” Buckman says.